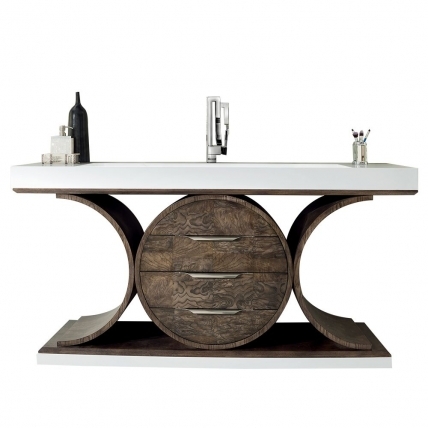 The stunning shape of the base of this single sink vanity will make a major impact on the over all look of the space where it is installed. The wood material has a section that is finished in a dark black tone while the rest is a lighter brown tone that shows that natural beauty of the wood grain. 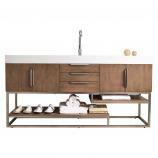 Aside from the outstanding look this piece brings to the bathroom it also provides useful functionality with a nice sized counter top area and three drawers for storage. The integrated sink and counter top are made from a bright white material that contrasts nicely with the wood tone finish of the base. 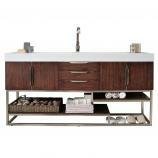 Material: This bath vanity is constructed of a combination of solid Birch wood and Ash Burl. Birch is a tree that is found all over the country and can be recognized by its white bark. It is similar to the Aspen species. 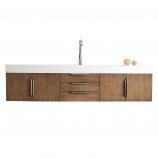 Birch lumber for solid stock is a smooth tight grained wood, usually light with a hint of red in its natural color. 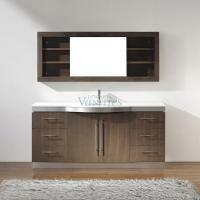 It’s very smooth and is a great choice for cabinet building, both painted and stained. All hardwoods have been Kiln dried to ensure a stable product that will not expand, contract, or warp.